A musician who has battled with mental health issues says the "comedown" after gigs can be "dangerously steep" and he has arranged a charity football match to raise awareness of the issue. The match in Ely will see bands from Bury St Edmunds take on Cambridge acts. Daniel Kingsley of History & Lore said: "You get such an adrenaline rush from any show, so people have to go out or drink to cope with that." Money raised will go to the Mental Health Foundation. The match, billed as Kick the Stigma, is being staged at Ely City's ground. 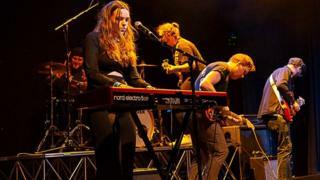 Mr Kingsley, 23, whose five-piece band is based in Cambridge, said he has spoken openly about his difficulties with anxiety and depression. The Anglia Ruskin University graduate said he came up with the idea of the football match because the sport encourages "a lot of things you kind of need to think about". "You need communication, teamwork," he said. "People are either into sport or music - I'm hoping we can find some common ground." The musicians have named their teams BSE Rock City FC and Cambridge Musicians United. Bands taking part also include Suffolk's The Glitter Shop, Kyanos, Tundra and The Catch, as well as some of the team behind The Music Blog 42 website which is based in Bury. As well as History & Lore, Cambridgeshire's team will also feature Staycations. Barny Cutter, from The Glitter Shop, said the match was a "perfect opportunity not only to network between other like-minded musicians, but also to raise money for an incredibly important cause". It is hoped the event, which kicks off at 15:00 BST, will raise about £500.